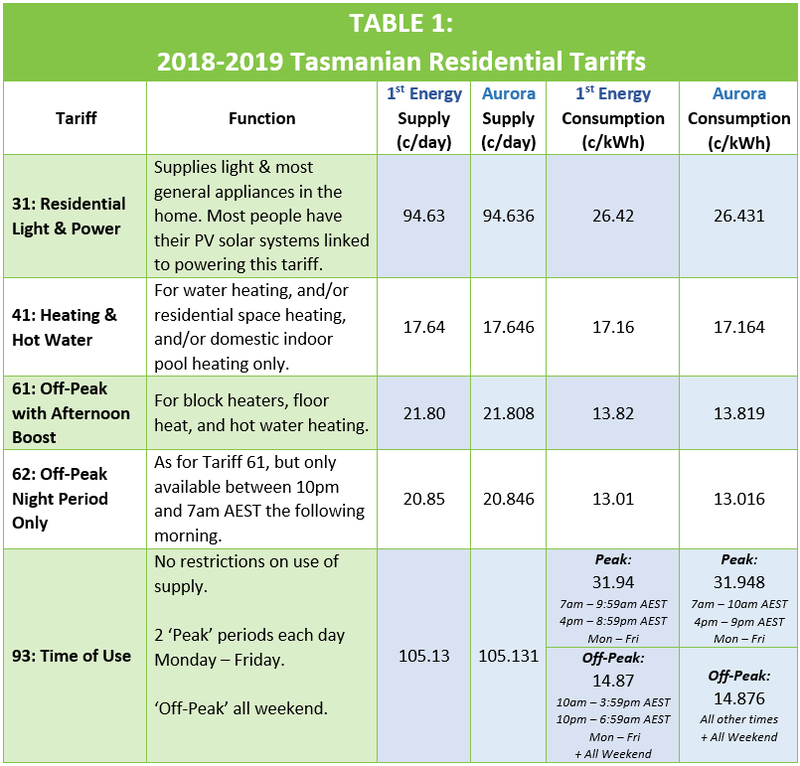 To help you better understand your Tariffs, we’ve provided an overview of the current Residential Tariffs available in Tasmania. A tariff is an agreed cost for providing energy between consumers and an Electricity Retailer. It includes both fixed (supply) and variable (consumption-based) charges. In Tasmania there are currently 3 possible Electricity Retailers for residential connections: Aurora, 1st Energy, and sonnenFlat. As a point of interest, Aurora prices have gone up 2% on both supply charges and power consumption charges from the 2017-2018 financial year. 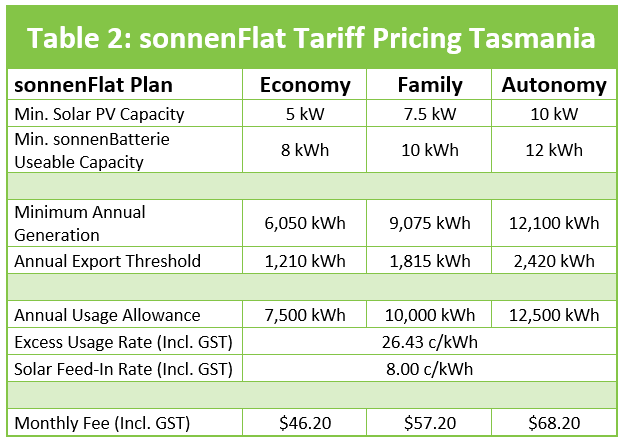 From October last year (2018), an alternative power tariff, sonnenFlat, was made available as an alternative Tariff to sonnenBatterie customers in Tasmania. There are three tiers of this alternative tariff available, based on the total solar/battery storage capacity of sonnenBatterie owners. For further information on this alternative option, please contact us directly, or refer to our news article on sonnenFlat. Power is not cheap. To reduce the financial and environmental cost of power, increasing numbers of customers are offsetting power consumption by installing residential solar PV (photo-volatic) systems. This enables customers to generate power for their own consumption, and to export surplus power back to the grid. Surplus power is purchased by your chosen Electricity Retailer at a rate determined by the Customers’ feed-in Tariff, an agreed amount paid by an electricity retailer for power exported to the grid. See How does solar power feed back into the grid? for further detail on how this works. 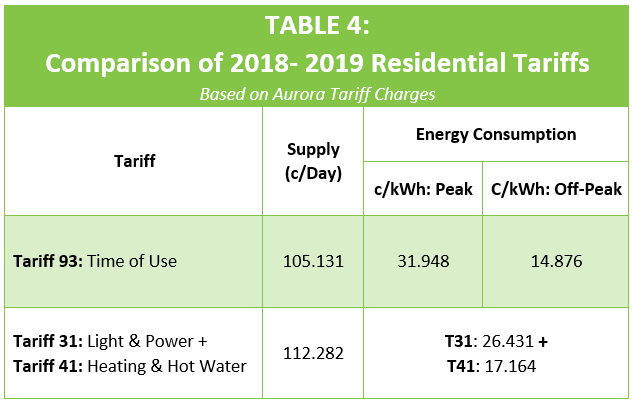 Aurora feed-in tariff prices have decreased from 8.959 c/kWh from the 2017-2018 financial year. In Tasmania, the benefit customers can receive from solar systems is curtailed by the fact that a solar system with a single inverter may only be linked to ONE Tariff (commonly Tariff 31). This means that surplus power not used by a designated Tariff is exported back to the grid, where it is sold, perforce, to your electricity retailer at a relatively low rate. * Power must then be re-purchased (at a minimum of twice the Feed-in rate) to supply other Tariff/s on the same residence, even when solar systems technically generate sufficient energy to meet all residential power needs. 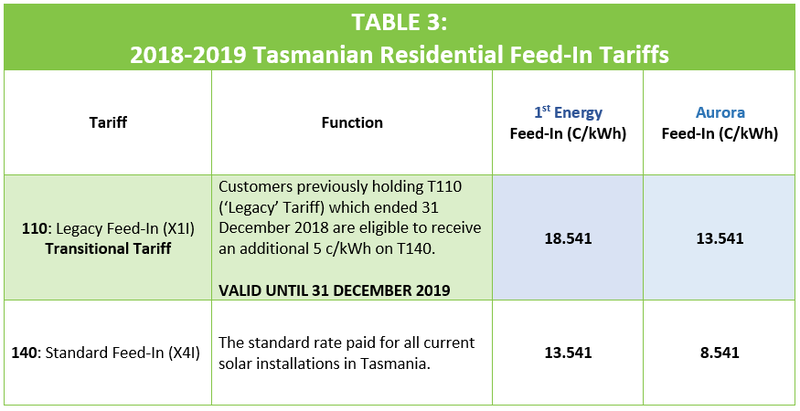 In an effort to address this issue, the Tasmanian Renewable Energy Association (TREA) made a submission to the Tasmanian Economic Regulator supporting the introduction of a ‘opt-in’ Time-of-Use Tariff (Tariff 93). ‘Opt-in’ means that customers may choose to switch from their current tariffs to this new tariff at their own discretion. This may involve a small fee for installing a new meter. *Unless you are on the Legacy Feed-In Tariff. Refer to Table 3 above. Residential customers, not being a ‘GST-registered business’, will be paid a flat rate of 8.00 c/kWh for any surplus power exported to the grid after the Customer’s ‘Minimum Export Threshold’ has been met. Due to its potential benefit for customers with a solar PV/battery storage system, we have considered Tariff 93 in detail here. We’ve based figures on Aurora’s values; 1st Energy is very similar. Tariff 93, the ‘Time of Use’ Tariff ,is based on two time-specific cost periods, Peak and Off-Peak. As seen in Figure 1, Peak periods are from 7-10am and 4-9pm AEST Monday to Friday, and are set to a premium power charge (31.307c/kWh). 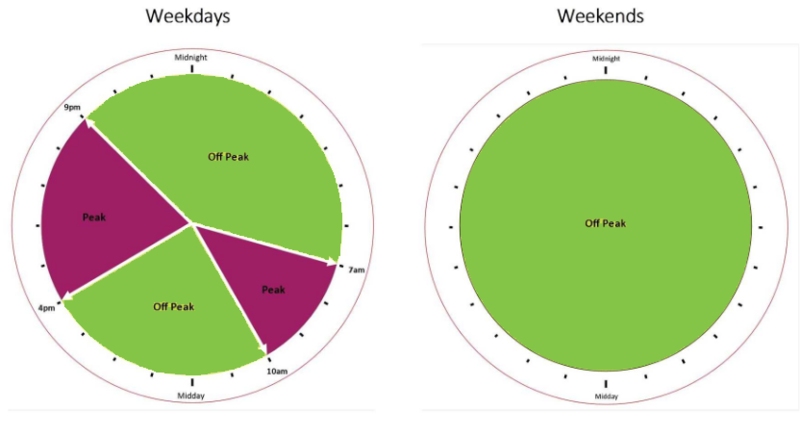 All other times (including weekends) are classified as Off-Peak, with an attractively low energy charge (14.577c/kWh). Please note: As these times are Australian Eastern Standard Times, they will not follow daylight saving changes. It is a significant benefit of this Tariff that there are no restrictions on the use of supply. This will enable customers to combine multiple Tariffs into one, maximising power consumption from residential solar systems. Despite real advantages from well-managed power consumption under this Tariff, consideration should be given to heating, hot-water, or any other device which would draw on substantial amounts of energy. If they habitually run or are much used during the peak-periods, this Tariff may not be the best option, or battery storage may be required to supplement power supply during these times. For those with Battery storage, this Tariff offers significant benefits. Batteries could be charged either from a solar array or the grid during off-peak times to ensure sufficient energy is available to power a residence during Peak times, allowing significant savings on grid-sourced energy consumption. For information on our battery storage options go to Solar Power Hybrid on our website and check out our Tesla Powerwall battery storage solutions. For more information on Tasmania’s Tariff and renewable energy situation visit the Tasmanian Renewable Energy Association.